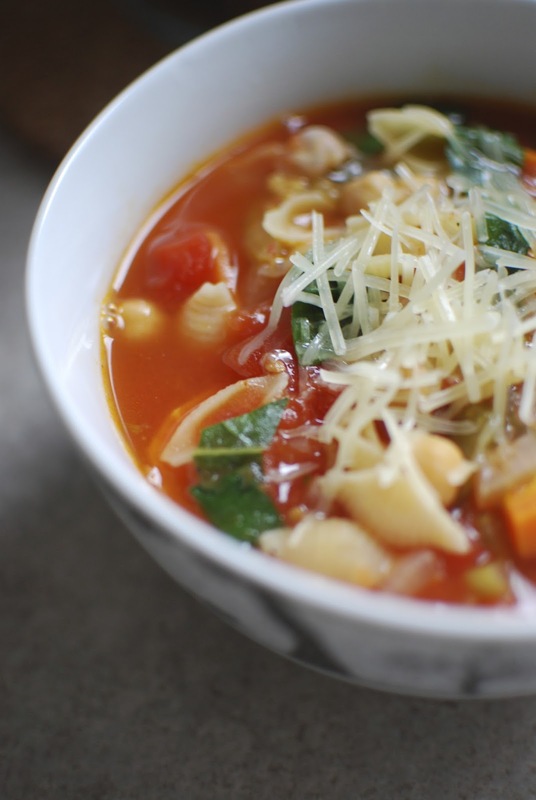 The snow is starting to fall and the temperatures are really starting to drop, so that only calls for one thing - soup! 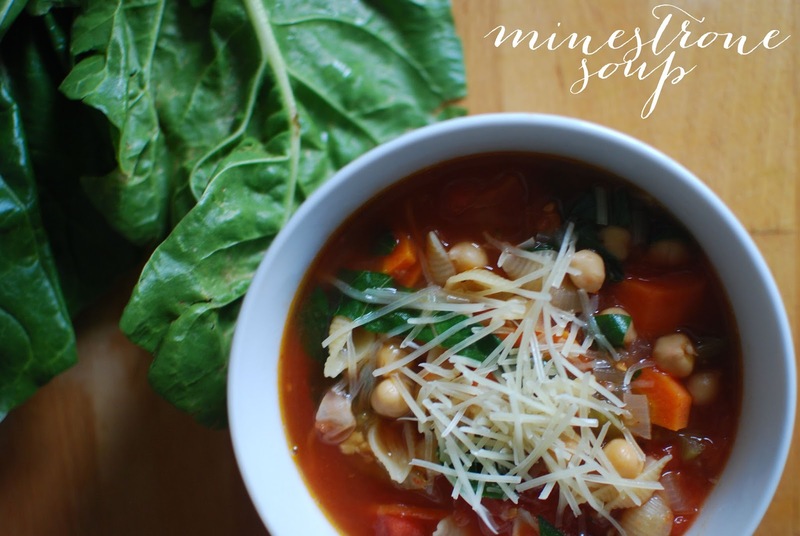 Minestrone has always been one of my favourites and this variation has chickpeas instead of kidney beans. It made a hearty pot so I'll be eating it for the next week! So, now down to the important stuff - what's in this that makes it so darn good! 1. In a large stockpot, heat oil over medium heat. Add in onions, celery and carrots and sauté until soft. Add in garlic and sauté for one more minute. 2. Add tomato paste, broth and tomatoes and bring to a boil. Reduce heat and simmer for 20 minutes. 3. Add chickpeas and pasta and simmer for another 10-15 minutes until pasta is tender. 4. Add in coarsely chopped swiss chard and simmer for 1-2 minutes, until swiss chard is wilted. 5. Remove from heat and add s&p to taste - serve with parmesan and enjoy! It really is a big bowl of comfort food. Warm soup, all the vegetables, the gooey cheese. Plus it all comes together in about 40 minutes total so it makes for a perfect weeknight meal! This is just the beginning of soup season for us. I have a ton of stuff up my sleeve as we lead up to Christmas, so stay tuned!